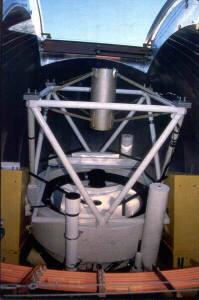 VATT The Vatican Advanced Technology Telescope on Mt. Graham, AZ. This is where I was last week. This is a 1.8 meter telescope on Mt. Graham in southeast AZ. My colleagues and I were observing the lightcurve of Haumea, one of the largest KBOS (or TNOs). 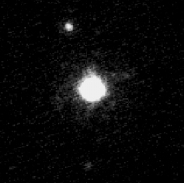 We were hoping to see one of the moons of Haumea pass in front of Haumea and cause a subtle change in the brightness of Haumea. To do this we took images of Haumea all nite long. Each image was 3 minutes of exposure time, so we ended up with several hundred images over the 3 nite run. 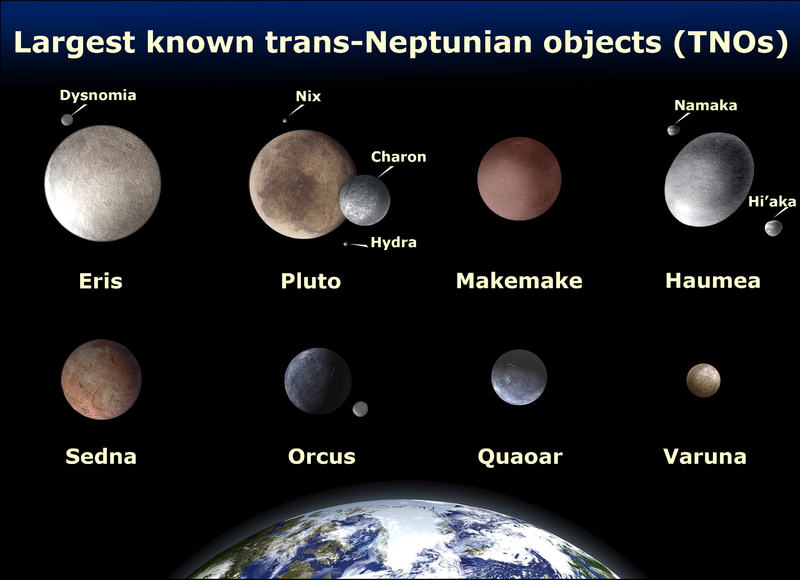 Eight biggest TNOs Haumea is the elliptical TNO with the two moons in the upper right of this chart. Haumea This is a view of Haumea and its 2 moons taken with Keck telescope and adaptive optics. A telescope without adaptive optics is not able to cleanly separate the moons and main object. (Some of our images show a little "bump" on the side, which is the brighter moon.) 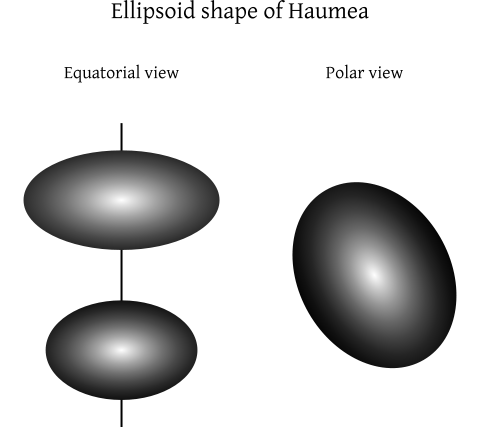 Even in this image, the shape of the main object is not resolved. 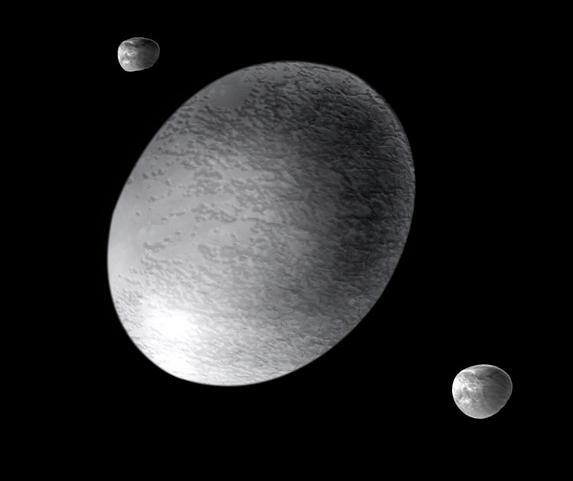 Haumea Haumea is quite elongated for its size. The shape model comes from analysis of the lightcurve of Haumea. We were looking for a slight deviation from the "normal" lightcurve (caused by non-spherical shape of Haumea) due to passage of inner moon across face of Haumea. The effect is predicted to be quite subtle, and so I will spend many 10s of hours in front of my computer carefully analyzing the images and measuring the lightcurve of Haumea before, during, and after the predicted event. Fortunately, Haumea has a short rotational period (3.9 hours) so we can get an entire lightcurve (whole rotation period) in one nite (or even two periods if nite is long enough and object is well-placed in the sky). 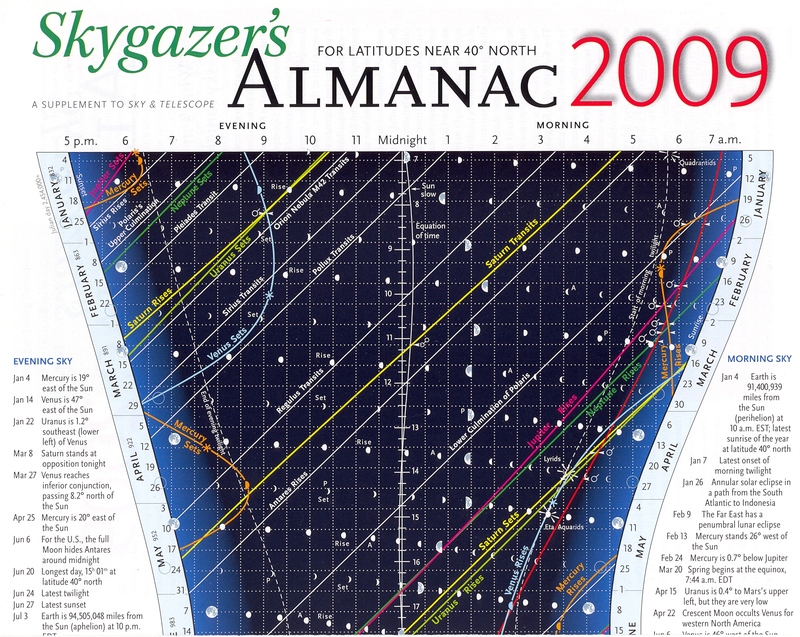 Almanac- appearance of Mercury This is a useful graphical almanac from Sky and Telescope that helps orient one to where planets and such are in the sky. The orange line marks the setting or rising time of Mercury. Note that, as seen from Earth, Mercury changes from an evening to a morning objects quite often (every month or month and a half) as Mercury orbits the Sun every 88 days. It never sets very late or rises very early, as it is always within about 28 degrees of the Sun. Inner Planets on 29 April 2009 The positions of the 4 inner planets on 29 April 2009. Each planet is marked with a colored circle with a cross in it. Note that if you draw a line from us (blue circle) to Mercury (orange circle) the line is almost tangent to Mercury's orbit, so Mercury is near a local maximum of its angular distance from the Sun. (I think the maximum angle was a few days ago). 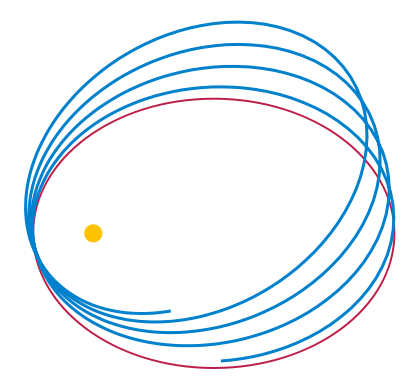 Relativistic Precession In a 2 body gravitational orbit, the direction of the long axis of the orbit is fixed in space and the orbit is closed. In reality, orbits of planets in the solar system are not closed because of the perturbations of other bodies. Mercury has a large major axis precession, mostly caused by the other planets. However, it was realized around middle of the 19th century (! 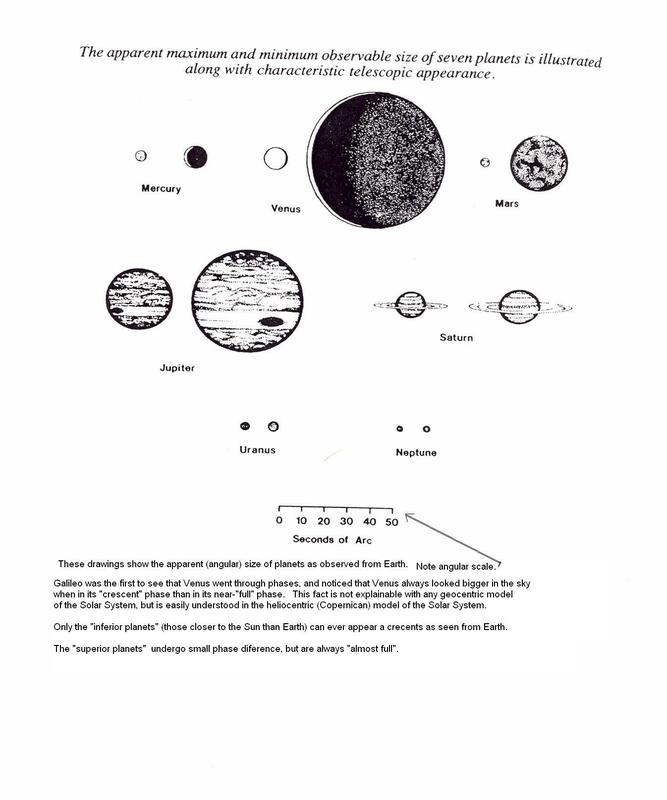 !- how they did this before computers is beyond me) that the observed precession of Mercury could be almost, BUT NOT QUITE TOTALLY, explained by the masses and orbits of the other planets. This problem came to be known as the "anomalous precession of Mercury". Around 1915, Einstein showed that his theory of General relativity could precisely explain the motions of Mercury. Decades of precision observations of the orbit of Mercury using radar have never seen a deviation from motions predicted by GR. Precession of Orbital Axis: The Movie This is just to get across the idea of major axis precession! Most of the precession of Mercury is due to other planets, only about 1% is due to GR. Phases of Mercury and Venus Both Mercury and Venus undergo a full range of phases. Both show the correlation of angular size and phase that arises naturally in the heliocentric theory. Because the ratio of maximum to minumum Earth- planet distance is less for Mercury than for Venus, the ratio of maximum to minimum angular size is smaller for Mercury than for Venus. Ice at pole of Mercury ? 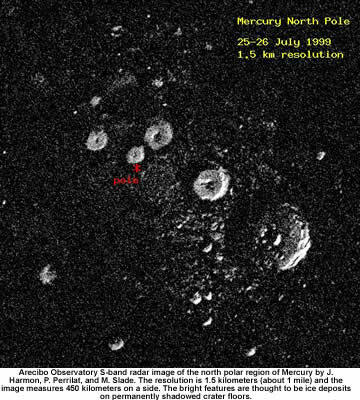 Radar observations of radar bright material in permanently- shaded craters near the pole of Mercury is usually interpreted as ice deposits. 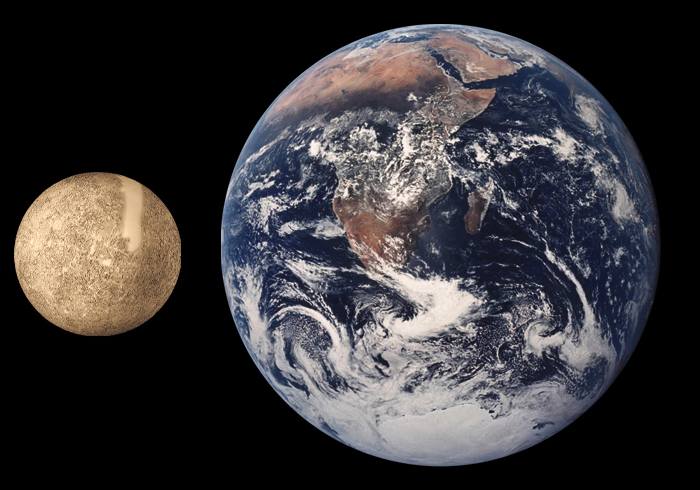 Because Mercury has only a very tenuous atmosphere, heat is not transported from equator to pole, as it is on Venus, so the poles can remain quite cold. 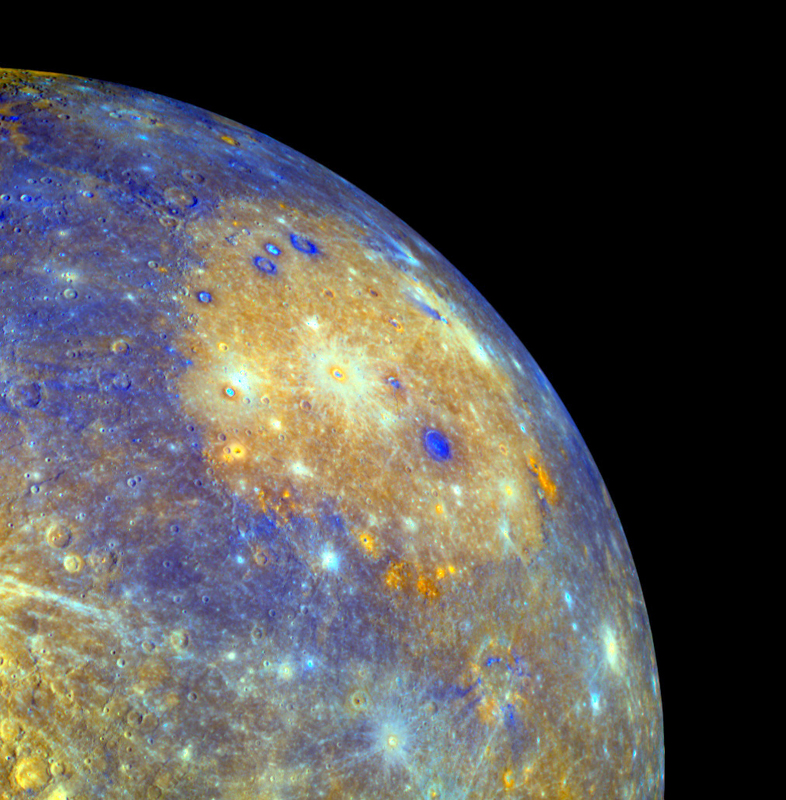 MESSENGER: MErcury Surface, Space ENvironment, GEochemistry and Ranging. 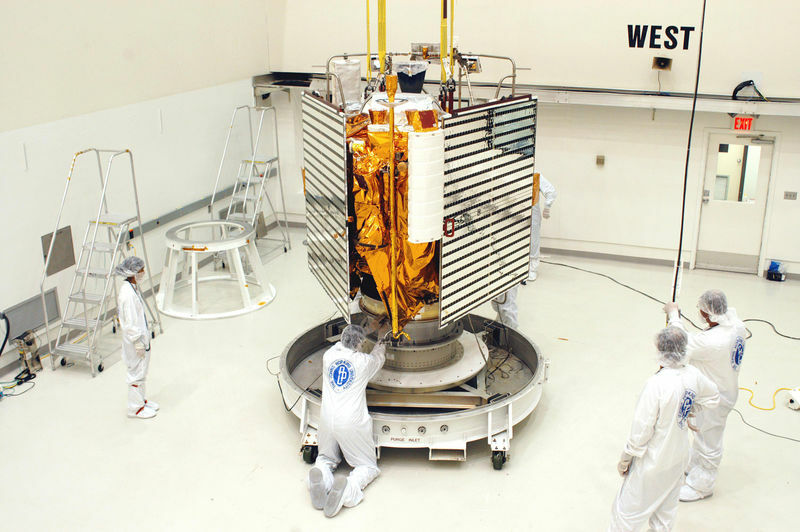 This spacecraft is on its way to orbit around Mercury in 2011. If all goes well, it will orbit Mercury for one Earth year. 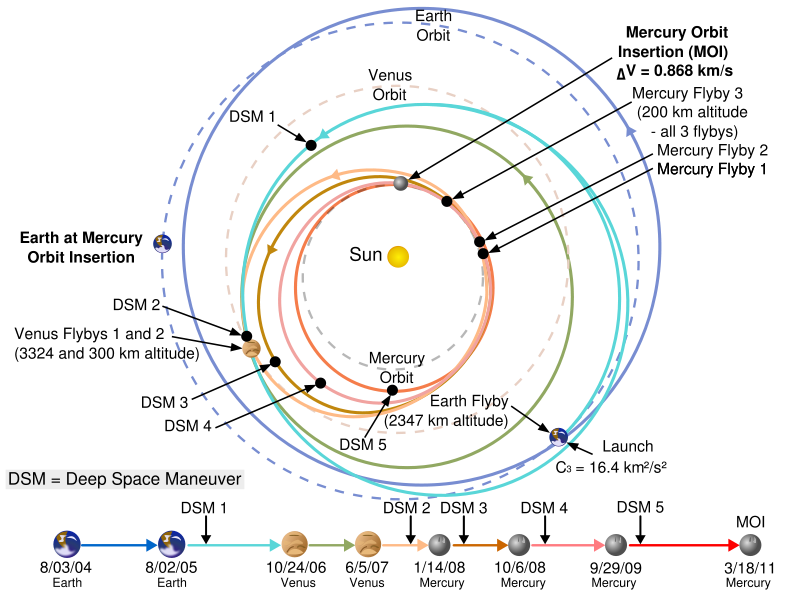 On its way to Mercury (via a complicated multiple-gravity assist orbit, as shown below) MESSENGER has already made several quick Mercury flybys and learned some interesting things. Just think what we will learn as the data from the orbital phase starts coming in! 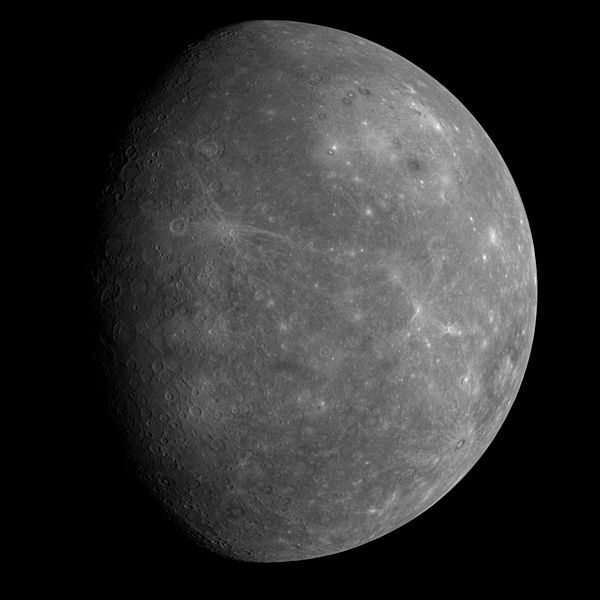 MESSENGER view of Mercury MESSENGER will make several quick flybys of Mercury on its way to orbit. 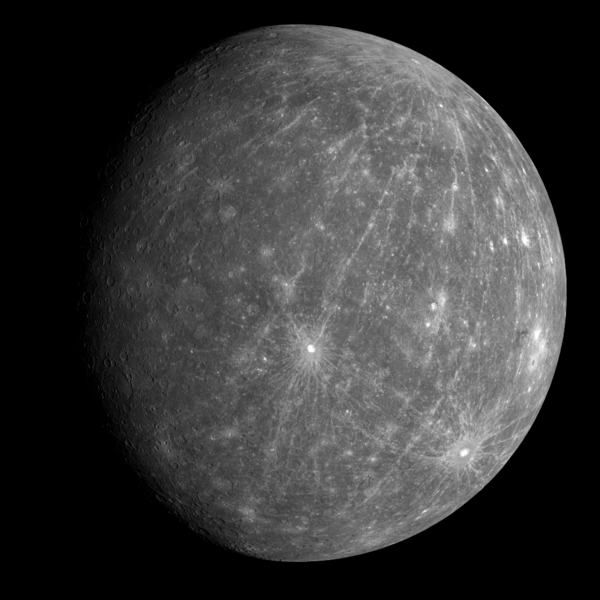 This is an image of the half of Mercury that was not imaged by Mariner back in the 1960s. Kuiper Crater A nice image of Kuiper Crater. 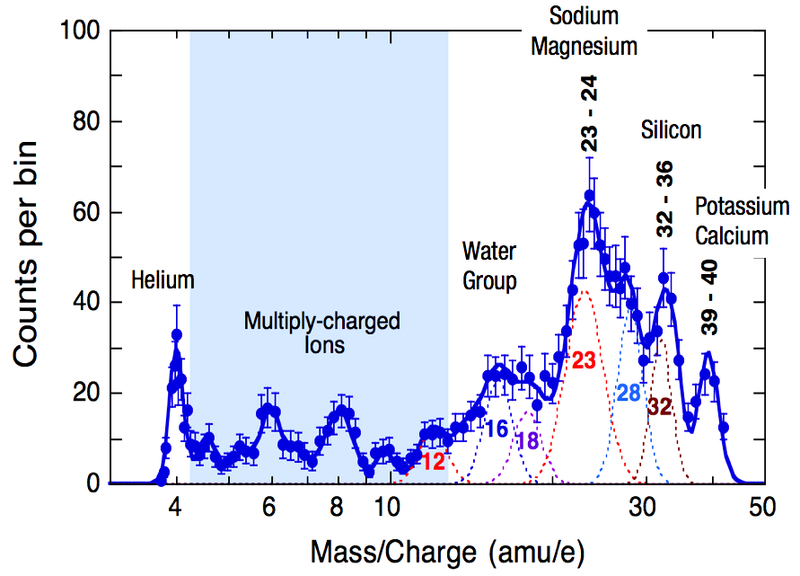 MESSENGER mass spec results As MESSENGER swooped by Mercury, it "sniffed" the tenuous atmosphere with a mass spectrometer, a device that sorts particles based on their mass to charge ratio. Astronomers were startled at the amount of water and water-derived ions that appear to be present. Of course, after MESSENEGER enters orbit we will have MUCH better data! Caloris Basin This image is made from several different colors of light. The orange spots at the edge of the large Caloris Basin are said to be volcanoes.